TECOPA — A dozen years ago the remote desert town of Tecopa, home to about a hundred full-time residents, offered travelers no amenities other than lodging—not a single restaurant, store, or gas station. Provided by Robin Flinchum/Special to the Pahrump Valley Times Times are changing here and a restaurant renaissance is underway in Tecopa. 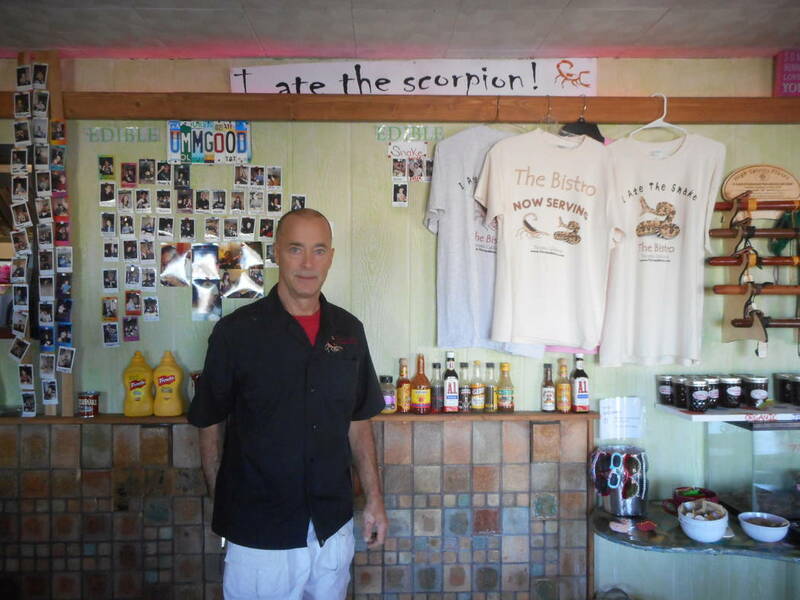 Ed Thomas of the Tecopa Bistro, standing by the scorpion wall showing photos of patrons who've eaten the Scorpion Parfait. Provided by Robin Flinchum/Special to the Pahrump Valley Times Outdoor view of the Tecopa Bistro. Changes are bringing a new look to the community and its restaurant scene. 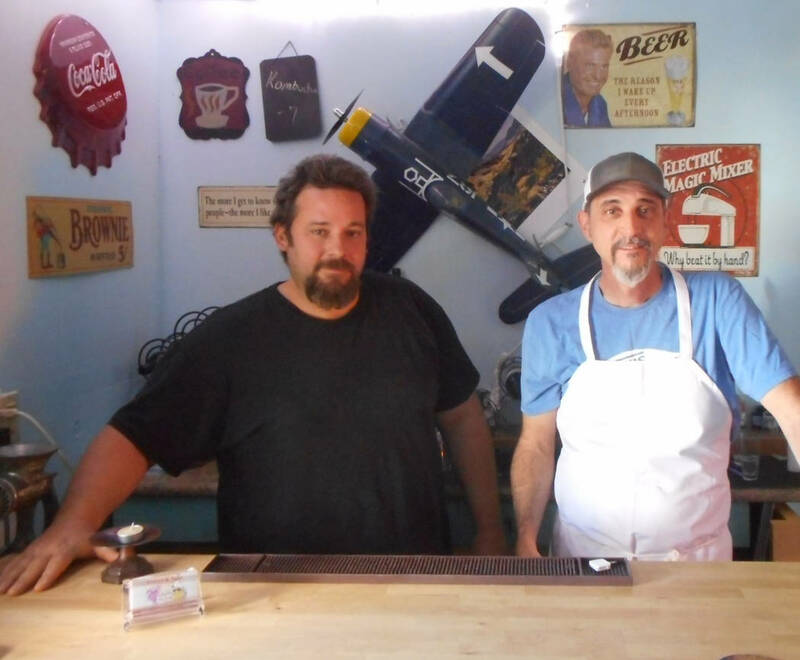 Provided by Robin Flinchum/Special to the Pahrump Valley Times Westley McNeal and his wife Courtney McNeal, often with their baby daughter in tow, are running a barbecue restaurant and their own craft brew pub called the Tecopa Brewing Company at Delight’s. 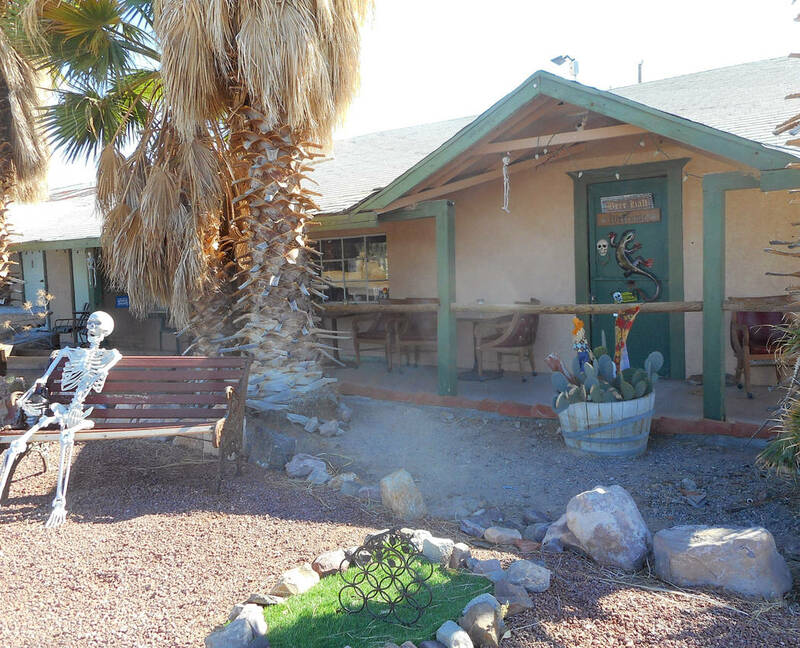 This photos shows the Outdoor view of the Tecopa Brewing Company. Provided by Robin Flinchum/Special to the Pahrump Valley Times This photo shows a front view of the Death Valley Brewing Company. Times are changing here and a renaissance is underway in Tecopa. Provided by Robin Flinchum/Special to the Pahrump Valley Times Jon and Cheryl Zellhoefer inside the Death Valley Brewing Company. In the Tecopa community overall, offerings now include a lot of farm-to-table organic produce, traditional comfort foods, gluten-free and vegan options, artisan beer, secret family recipes and a surprising wealth of knowledge and experience among the chefs, brewers and restaurateurs. Provided by Robin Flinchum/Special to the Pahrump Valley Times Eric Scott (left) and Joe Flannery (right) inside Steaks and Beer. 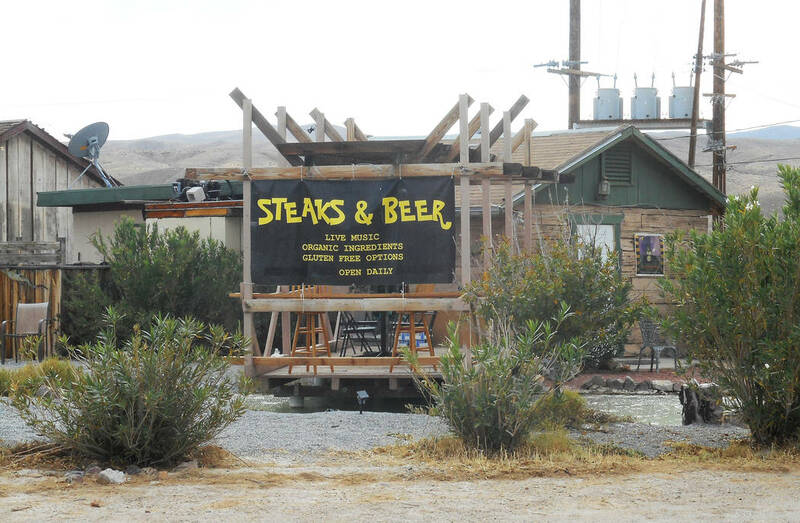 Times are changing in Tecopa and a restaurant renaissance is underway in Tecopa. Provided by Robin Flinchum/Special to the Pahrump Valley Times Outdoor view of Steaks and Beer showing the patio over the fishpond. In Tecopa overall, offerings in the community now include a lot of farm-to-table organic produce, traditional comfort foods, gluten-free and vegan options, artisan beer, secret family recipes and a surprising wealth of knowledge and experience among the chefs, brewers and restaurateurs. Cold beer was a distant memory unless you brought it with you. But times are changing here and a restaurant renaissance is underway as four independent eat-and-drinkeries opened their doors for the cool weather season. On Oct. 13, the Tecopa Brewing Company became the second microbrewery in town when it opened in an existing barbecue restaurant on the grounds of Delight’s Hot Springs Resort. Now it takes its place in Tecopa’s epicurean lineup beside the Death Valley Brewing Company (the town’s original microbrewery), a gourmet steakhouse called Steaks and Beer, and down-home Southern cooking at the Tecopa Bistro. The offerings include a lot of farm-to-table organic produce, traditional comfort foods, gluten-free and vegan options, artisan beer, secret family recipes and a surprising wealth of knowledge and experience among the chefs, brewers and restaurateurs. This renaissance began in the summer of 2006, when Las Vegas chef John Muccio escaped the pressures of the city with his then teenage son, Ryan, and spent a hot summer cleaning out an old building at the Tecopa Hot Springs Resort. That fall he opened Pastel’s Bistro, serving an eclectic menu of gourmet and comfort food to an ecstatic local and tourist clientele. A few years later, when another highly-trained, overworked and exhausted Las Vegas chef came out to Tecopa for the weekend, he was surprised to find Muccio there. “John taught me how to cook Italian when I was 19,” said Eric Scott, who soon followed in Muccio’s Tecopa footsteps. He opened the Death Valley Internet Café down the road from Pastel’s in a remodeled gas station and boxcar at the entrance to Delight’s Hot Springs Resort. Tecopa had two restaurants then, each with enough clientele to keep them going. What it didn’t have, noticed longtime local property owner Jon Zellhoefer, was a place to have a drink. Zellhoefer’s father owned the area known as ‘downtown Tecopa’, where the Old Spanish Trail Highway meets the Tecopa Hot Springs Road, back when the mines were going full time and the town had a robust population. In those days the property housed a somewhat infamous saloon called the Snakepit. That closed down in 1996, Zellhoefer said, and the property remained vacant for many years. 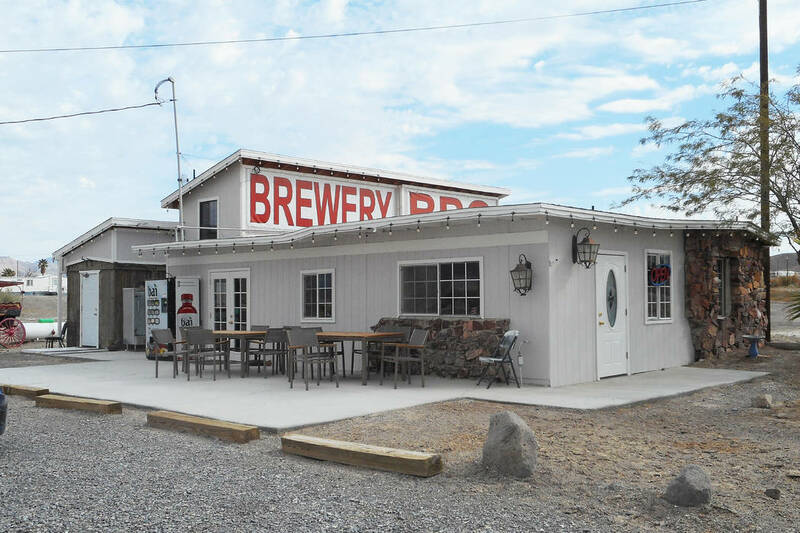 “It was already zoned for it,” Zellhoefer said, “it’s something you can do small and it’s artistic.” He remodeled a small building on the property and he and his wife Cheryl Zellhoefer opened the Death Valley Brewing Company in 2014, selling artisan beers brewed on site. It was a new venture for Zellhoefer, who has been a schoolteacher, an industrial production manager, and has even run for governor of California. He discovered he had a passion for the crafting part of the craft beer business. The brews, said regular patron Bo Nilsson, originally from Sweden and now living in Pahrump, are “world class. No better beer anywhere else in this world.” Death Valley Brewing Company also serves homemade root beer, bratwurst and burgers. When the business outgrew its first small building, he moved into the larger complex next door to the old Snakepit and expanded. After a year at the Death Valley Internet Café, Eric Scott left the Delight’s property and moved into the small building Zellhoefer had vacated. It’s tiny, with only two indoor tables, but has plenty of outdoor seating and an unusual patio suspended over a fish pond. Scott opened in 2016 with a new partner, longtime friend and fellow chef Joe Flannery. Scott and Flannery learned French cuisine in Vegas together. He also had a new business name, Steaks and Beer. “We’re not trying to reinvent the wheel,” said Flannery, “it’s simple, that’s what we’re about.” The small restaurant also offers vegetarian dishes and gluten-free options, Scott said. They serve a variety of beers, including local brews when they’re available. Between them, Flannery said, they have over fifty years of training and experience in French cuisine. Both have worked in four-diamond restaurants on the Strip, including Andre’s French Restaurant. At one point, said Scott, he was cooking 700 steaks a night at STK on the Strip. In Tecopa, the two men, both in their 40s, said they found freedom. “Freedom from the corporations, to cook what we want,” said Scott. Steaks and Beer just opened for its second season and Scott says they’re hoping to soon offer all grass-fed beef and go completely organic. McNeal says he gained experience making homebrews and experimenting with the original family recipes for the barbecue sauces and rubs they use at the restaurant. They also serve a breakfast menu. The pub brews its beers on site and began the season offering an established stout and a lager. He also has two India Pale Ale recipes in progress and will decide on one of them soon, McNeal said. And whatever happened to Pastel’s Bistro? John Muccio retired in 2014 and Pastel’s became the Tecopa Bistro in the hands of the Thomas family, transplants from outside Baltimore, Maryland. 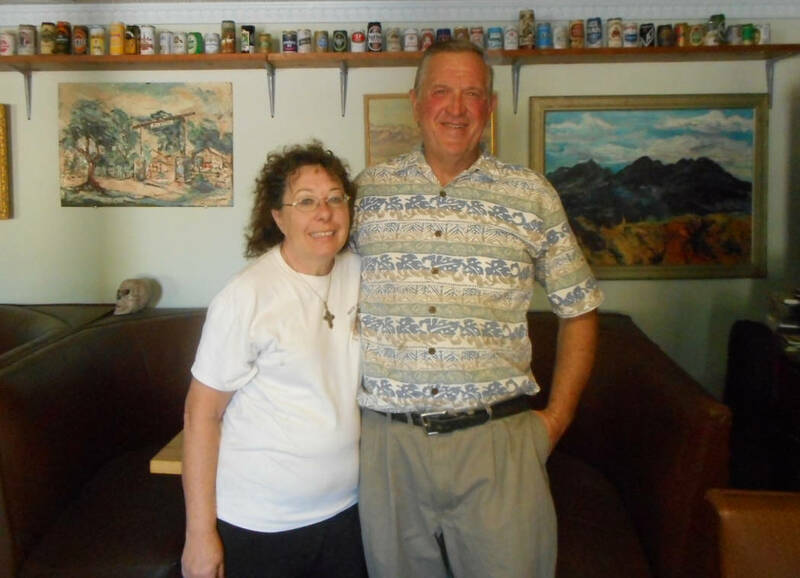 Ed and Sharon Thomas came to Tecopa when Ed was experiencing health issues, he said. With the help of their son Ryan Thomas, part of the concessionaire partnership in charge of the Tecopa Hot Springs Campground, the Thomases took over the running of the restaurant. They love the desert, Thomas says, and have never regretted their decision. 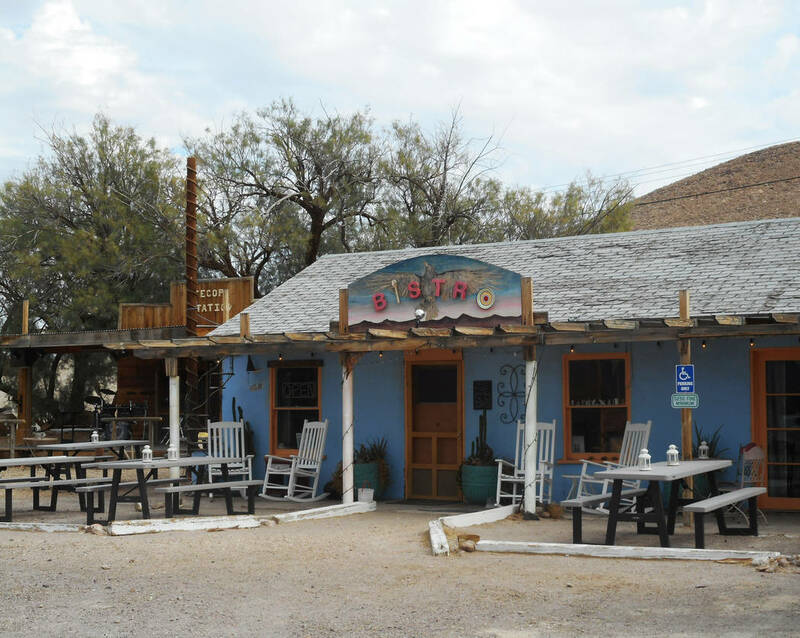 The Tecopa Bistro menu is where the “Old South meets the Wild West”, Thomas said. Selections include his specialty gumbo and smothered pork chops, as well as novelty items like rattlesnake pizza and a scorpion parfait. (And no, said Thomas, they don’t catch the scorpions locally. They could, but it would be a health code violation.) The Bistro also serves a Firehouse Burger and Firehouse Fries, proceeds from which are donated to the local fire department. For each of the proprietors, the restaurant renaissance began when they were drawn to this quiet corner of the desert, small enough to be peaceful, big enough to allow creative freedom in the kitchen and the brewing stations.